When you order stickers or labels from StickerYou, you can choose what format you would like your stickers to be printed on. The options are Sticker Pages, Kiss-Cut Sticker Singles, Die-Cut Sticker Singles, or Rolls. You can choose your format under the heading Product Type in the Sticker Maker, after you have uploaded or created your sticker or label design. Choosing between these different options may affect your pricing, and sometimes, determine the quantity of stickers you can order. Here’s how to decide which you should choose, and what to expect. What they look like: Sticker pages are vinyl adhesive sheets, roughly the size of US letter size paper (8.5x11”). If you have only one sticker design, your stickers will be repeated and aligned in rows to fill the sticker page. If you create a custom sticker page, your different designs will be arranged on the sticker page according to how you set them up in the PageMaker tool. You will be able to peel each sticker off these pages. Material Choices: There are three material options for sticker pages; glossy white vinyl, matte white vinyl, and clear vinyl. 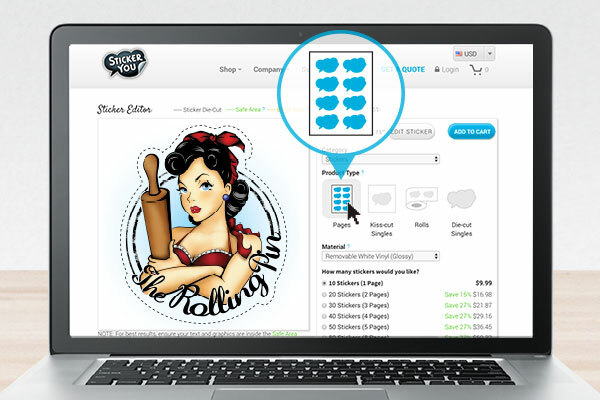 How to Choose Pages: If you create a custom sticker page with multiple sticker designs using our PageMaker Tool, your stickers will automatically be set up as a sticker page. 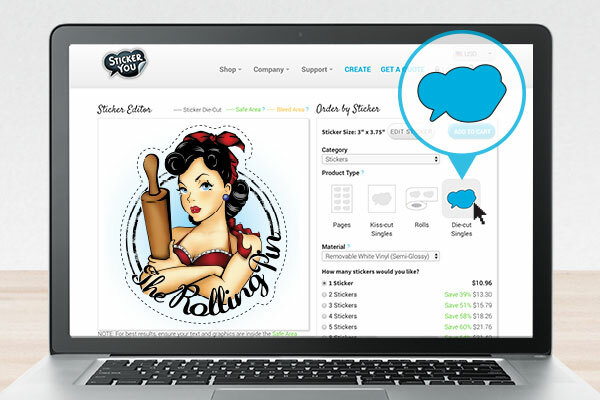 If you only have one sticker design and want your sticker page filled with the same design, choose the option Pages under Product Type in the order menu. 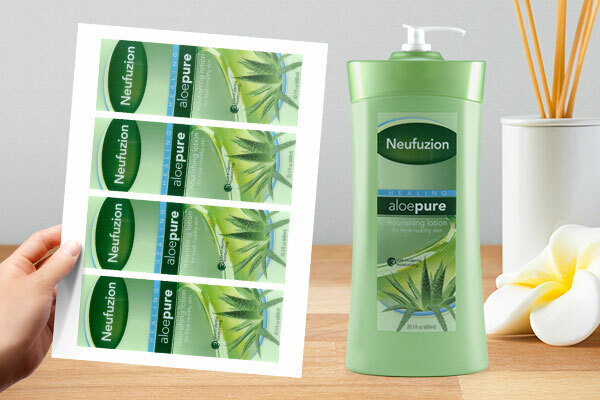 When to Choose Pages: Sticker pages are the best option when you are ordering a smaller quantity of stickers or labels (250 or less), where they will all be used for one purpose, and you do not need the stickers separated before applying them. For example: If you are ordering a small number of product labels, if you are labelling personal items, or if you are creating a sticker sheet for kids, then Pages is the best option. Ideal for: Address Labels, Favor Labels, Bottle Labels, Kids ID Labels, etc. What they look like: Kiss-Cut Sticker Singles look like mini sticker pages. The size of the mini-sticker page will be determined by the size of your sticker or label design. Your stickers or labels will arrive in stacks. Only one sticker will be on each mini-page. You can peel the sticker off this individually cut mini-page. Material Choices: There are three material options for Kiss-Cut stickers or labels; glossy white vinyl, matte white vinyl, and clear vinyl. How to Choose Kiss-Cut Sticker Singles: To order Kiss-Cut Sticker Singles, choose the option Kiss-Cut Singles under Product Type in the order menu. Please note, if you create a custom sticker page in our PageMaker tool, you will not be able to choose Kiss-Cut Sticker Singles as an option. Kiss-Cut Sticker Singles can only have one sticker design on each mini-page. To create individually cut-out stickers with multiple designs, please order using Die-Cut Sticker Singles. 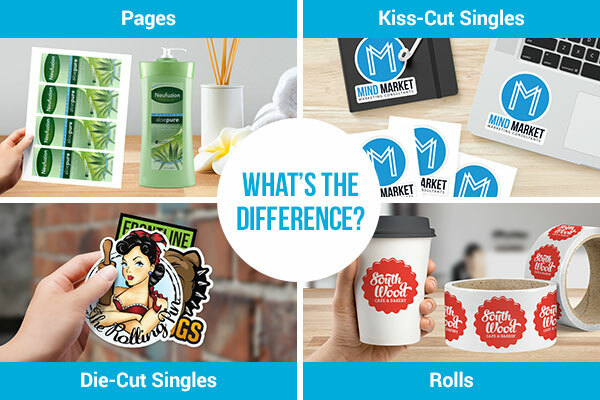 When to Choose Kiss-Cut Sticker Singles: This option is ideal if you need to be able to separate each sticker, or if stickers are being used for different applications. Kiss-Cut Sticker Singles make great handouts, swag material, or giveaways. You can use them to promote your business or event. This product does have a minimum order quantity. Ideal for: Logo Stickers, Bumper Stickers, or promotional stickers etc. What they look like: Die-Cut Sticker Singles are similar to Kiss-Cut Sticker Singles, however they have a more premium appearance. Die-Cut Sticker Singles are individually cut, and will be delivered in stacks (not on sheets). Each sticker is contour cut around the design of the sticker. These stickers do not come on a mini-page, and the paper backing is cut to the shape of the sticker. Each sticker will have a thin white border around it that acts as padding, ensuring the cutting machine does not cut into your sticker design. You can remove the white padding by adding bleed or a background color to your design. This requires extending the background of your sticker past the dotted orange bleed line in the Sticker Editor. Material Choices: Die-Cut Sticker Singles are only available in a white vinyl material with a matte finish. How to Choose Die-Cut Sticker Singles: To order Die-Cut Sticker Singles, choose the option Die-Cut Singles under Product Type in the order menu. Please note, if you create a custom sticker page in our PageMaker tool, you will not be able to choose Die-Cut Sticker Singles as an option. If you would like multiple designs as Die-Cut Sticker Singles, you must design each sticker separately and add them to your cart as different products. When to Choose Die-Cut Sticker Singles: Die-Cut Sticker Singles are the best option if you plan on separating the stickers, or giving them away. 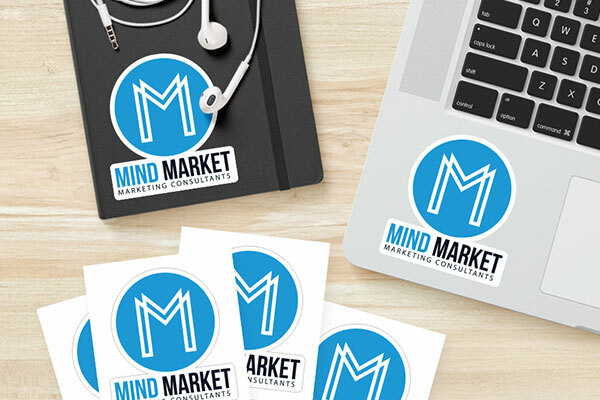 These stickers are great for promotional use, for events, or to sell as merchandise. Read more on Die-Cut Sticker Singles here. 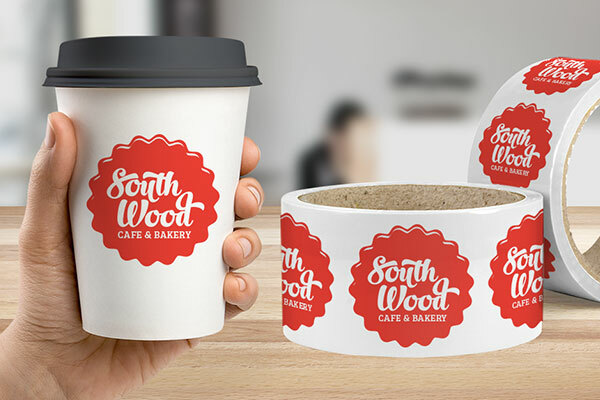 What they look like: When you choose rolls as your format, your order will be delivered on rolls of 250 stickers per roll. Each roll core is about 3” in diameter. Your stickers or labels will be on a backing paper roll, which is wrapped around this core. Your stickers will be die cut, so there will be no excess sticker material around the design. Your stickers will easily peel off the backing material. Durable Roll Labels - BOPP (biaxially oriented polypropylene) white vinyl material. This is a plastic based material. Learn more about our BOPP material labels here. Writeable Roll Labels - White paper base, with no laminate. You can write with pen on this material. How to Choose Rolls: To order Roll stickers or labels, choose the option Rolls under Product Type in the order menu. 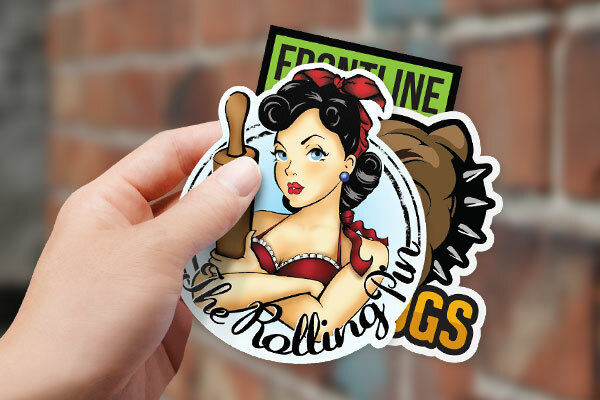 When to Choose Rolls: Roll stickers or labels are the best option when you are ordering a larger quantity (250 or more) and will be using the stickers or labels for the same application. As these stickers are printed and delivered on a roll of 250, this is not the best choice if you need the stickers or labels separated (like for handouts or giveaways- unless you intend on ripping them off the roll manually). If you are running a small business and wish to label a large number of products, roll labels is the best choice. Ideal for: Product labels, labelling equipment, use in a business, etc.